(CNN) -- A North Korean rocket slated for launch sometime early next month can be clearly seen in a satellite photograph taken Sunday, the Institute for Science and International Security said Sunday. The latest satellite image shows a rocket sitting on its launch pad in the north east of the country. 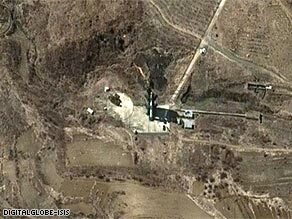 The satellite imagery, obtained by the ISIS from DigitalGlobe, is said to show the rocket at the Musudan-ri launch site in northeastern North Korea. The image casts a shadow on the ground below. CNN could not independently confirm the information provided by the institute, led by former U.N. nuclear inspector David Albright. Defense Department officials were not immediately available for comment. U.S. Defense Secretary Robert Gates said Sunday there is little doubt that the planned launch is designed to bolster that North Korea's military capability. The North Korean government says it will launch a commercial satellite atop a rocket sometime between April 4 and April 8. "I don't know anyone at a senior level in the American government who does not believe this technology is intended as a mask for the development of an intercontinental ballistic missile," Gates said during an appearance on "Fox News Sunday." Gates noted that while the United States believes it is North Korea's "long-term intent" to add a nuclear warhead to any such missile, he "personally would be skeptical that they have the ability right now to do that." Japan recently mobilized its missile defense system -- an unprecedented step -- in response to the planned North Korean launch, Japanese officials said. The move, noteworthy for a country with a pacifist constitution, is aimed at shooting down any debris from the launch that might fall into Japanese territory. In a concurrent response, U.S. Navy ships capable of shooting down ballistic missiles are being moved to the Sea of Japan, a Navy spokesman said Thursday. Gates said that the U.S. military could shoot down "an aberrant missile, one that was headed for Hawaii ... or something like that, we might consider it, but I don't think we have any plans to (do) anything like that at this point." He does not believe North Korea currently has the technology to reach Alaska or Pacific coast. Gates said that impending missile launch is a clear demonstration of the failure of the recent six-party talks to disarm the North Korean regime. "It's very troubling. The reality is that the six-party talks really have not made any headway any time recently," he said. "If (the missile launch) is Kim Jong-Il's welcoming present to a new president ... it says a lot about the imperviousness of this regime in North Korea to any kind of diplomatic overtures." Gates said that he believes economic sanctions are the best tool to getting countries like North Korea and Iran to the negotiating table. Both countries are believed by the United States and other Western nations to be trying to acquire a nuclear capability.